When Richard Paul Evans was twelve years old, his father fell and broke both of his legs. With no income and no insurance, the Evans family was destitute. At this time a multimillionaire taught young Evans the five secrets to wealth. 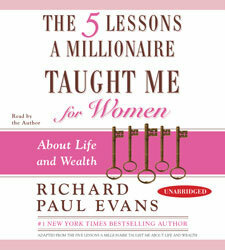 Evans used those five secrets not only to change his life but that of thousands of others when he wrote The Five Lessons a Millionaire Taught Me About Life and Wealth. An international bestseller, this essential work interweaves those influential lessons with personal stories from everyday people. Evans explains that money should not be the preoccupation of our lives, but instead our focus should be on the principles that free us to concentrate on God, family, and relationships -- life's true riches. Now Evans has taken years of personal research and coaching to create the perfect money guide for women who want a better life. With his classic, motivational voice, Evans offers lessons that are easy to understand and simple to follow. Powerful, proven, and life changing, The Five Lessons a Millionaire Taught Me for Women may be one of the most important works you will ever listen to.